Please buy your TI-Nspire CX on Amazon . With a new school year upon us, I’m bound to get a flood of questions from students about which graphing calculator is right for them. Since the new color TI-84 Plus C Silver Edition is now on the market, I’m assuming the question of the TI-Nspire CX vs. the TI-84 Plus C will be one of the biggest questions I get this school year. I have done both a TI-Nspire CX review and a TI-84 Plus C review, so you may want to check those out. However, I thought it’d also be helpful to do a side by side comparison. I’m not very interested in technical specs. You can find those elsewhere. Let me start by saying that these are both very good calculators. They both have very high resolution, full color screens. They both have internally rechargeable batteries. They both allow you graph on photographs. If your school pushes you are to pick one or the other up, you should probably just go with the flow because you can do well with either one. As I said in my 84 C review, it was a much bigger upgrade than I was expecting, and I think it’s a good device. That said, if you have the choice, I’d go with the TI-Nspire CX. 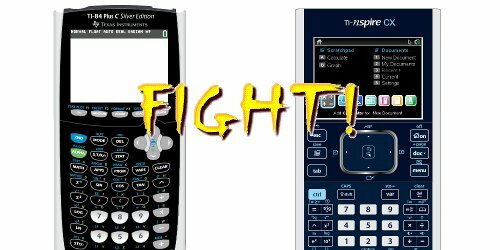 Even with the freshening up, the TI-84 Plus C is still no match for the TI-Nspire CX in a number of categories. When I’ve had a room split down the middle between students on TI-Nspire models and students on TI-84 Plus models, there are a few places where the TI-Nspire CX students have things easier. The video that follows demonstrates those places, as does the write up that follows it. TI-Nspire models automatically detect most points of interest such as x and y-intercepts, maximum values, and minimum values when you are in trace mode. TI-84 Plus models require you to use a series of left and right bounds and guesses to find those same values. While the TI-Nspire CX does allow you to find values this way, it’s not a requirement, and it makes finding points of interest much easier. The TI-Nspire CX will also find all points of intersection of two graphs in the viewing window simultaneously rather than one at a time like the TI-84 Plus C.
Some really nice features of the TI-Nspire CX are baked right into the operating system. These include spreadsheets, dynamic geometry software, an equation solver, and inequality graphing. The same features on the TI-84 Plus C are only accessible via apps like PlySmtl2, CabriJr., and Inequality Graphing. These apps do their job, but if you’ve used both models regularly, it doesn’t take long to see that it’s more convenient when these features are built right into the operating system like on the TI-Nspire CX. The TI-Nspire CX has a file and folder system similar to what you see on a PC or Mac. This allows students to save their documents, and it allows teachers to create documents and sent them to students. It’s great for saving your work, but even better for teachers who want to use a Navigator wireless system to send activities to students to work on with their Nspire CX’s. The menu system on the TI-84 Plus C is a big improvement over what was available on the TI-84 Plus Silver Edition just 3 or 4 years ago. The Alpha F1-F4 pop-up menu system that Texas Instruments implemented was very helpful and I’d advise all owners to take advantage of it. It’s still not as comprehensive as the TI-Nspire CX drop-down menu system, however. Much like a computer program with a well organized menu system, it’s often possible to find the feature you’re looking for just by navigating the main menu. Again the TI-84 Plus C does have a dynamic geometry app, Cabri Jr. It requires a lot of hunting and pecking, though, and I haven’t found it very practical for classroom use. On the other hand, the TI-Nspire CX’s dynamic geometry software is really amazing. At my school, we have started using it as a complete replacement for desktop dynamic geometry software. It’s surprisingly feature rich for a handheld device, and part of what makes it easier to use is the next time on my list. The TI-Nspire CX has a touchpad. This makes the screen so much easier to navigate than a simple directional pad (although it can be used that way). It’s helpful whether you are moving the cursor like mouse for menu item selection, moving a point while tracing a graph, or grabbing a figure in the dynamic geometry software. It’s a feature that the TI-84 Plus C arrow keys just can’t match for ease of use. The TI-84 Plus C only has buttons for sine, cosine, and tangent. The TI-Nspire CX also has cosecant, secant, and cotangent. I know that some “old school” types will turn up their noses at me on this one, pointing out that there’s no reason you can’t find the reciprocal trig functions using sine, cosine, and tangent. I’m just telling you, it is confusing for weaker students. They really start to get into trouble when you ask them to find arcsec, arccsc, and arccot. The TI-Nspire CX saves a lot of headaches here. The TI-84 Plus C Silver Edition is still a fine calculator. However, the TI-Nspire CX has some inherent advantages that the 84 Plus C can’t match. I haven’t touched on all of them here, either, but have focused on the issues my students usually encounter first. If you are given the choice, I’d opt for the TI-Nspire CX.